Scientists can now use heat to check out the internal workings of a cell. All they need is lasers and titanium. This means that one day they might be able to figure out how a disease takes hold before it attacks more than one cell in your body. 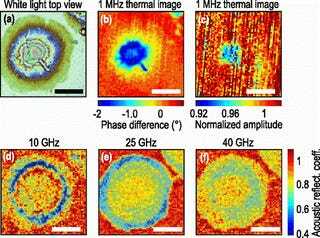 Scientists at the University of Bordeaux and French National Centre for Scientific Research have found a way to get a unique thermal view of the inside of a cell. Described in the journal Applied Physics Letters, this imaging technique view will be familiar to fans of 1980s action movies, namely the Predator franchise. It lets the scientists use heat to see not only the cell itself, but its individual parts—and how those parts are working. A laser hits a thin sheet of titanium. It’s not a strong laser. No one at the University of Bordeaux is trying to vaporize anything. It merely heats the titanium sheet by a few degrees over a very small area. The titanium, like any metal, slightly deforms due to the heat. This tiny bump is subsequently probed by secondary lasers. If the titanium deforms, and subsequently reforms, one specific way, it is merely a thin sheet of metal. If it reforms another way, it is a piece of metal with a cell on the other side, absorbing some of the heat. Cells absorb and give off heat differently depending on a number of factors. Cancer cells have a notoriously high metabolism and are relatively warm as a result. Various parts of the same cell will also absorb heat at different rates which is what causes the cell’s parts to show up on the image. Researchers will be able to see, for example, the various organelles that generate energy for the cell or break the cell down during cell death, at work. Stopping cancer, of course, is a valiant goal no matter how scientists get it done.